Whether you're cooking at home or visiting friends or family for Thanksgiving or another holiday, the turkey may seem to be the least of your worries when trying to avoid food allergens. Depending on your allergies, though, that may not be the case. Some turkeys are processed, and contain common allergens, even if they look unprocessed. Here's how to buy a safer turkey. There are several different types of turkeys for sale in most supermarkets. Basted or self-basting turkeys, which include most well-known commercial turkey brands, are injected with some sort of solution to make them tender. These solutions may include common allergens, such as soy-based or milk-based ingredients. Natural turkeys must by law be "minimally processed." Turkeys with that label cannot be fundamentally different than a turkey in its raw form. 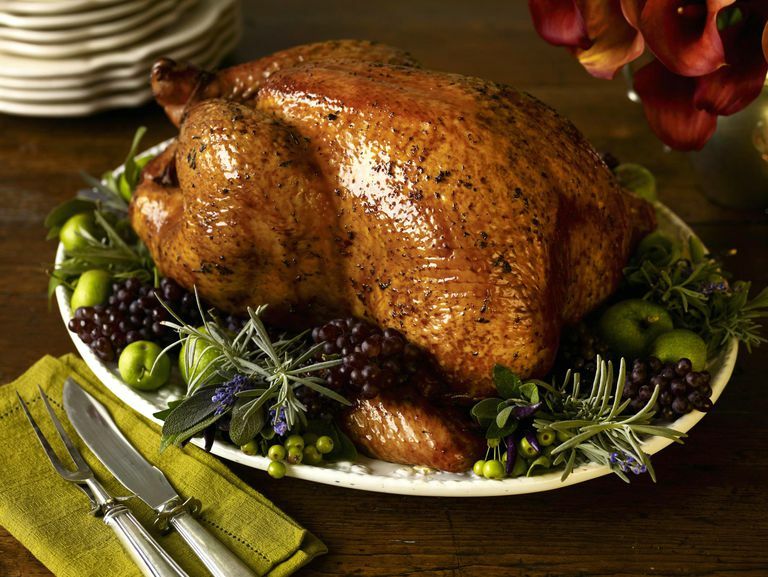 Check labels, but natural turkeys should contain nothing but turkey and, perhaps, water. These turkeys are commonly sold refrigerated, not frozen, although you can find frozen natural turkeys, too. Organic, fresh, free-range, ready-to-eat, and kosher do not have set and consistent meanings as far as additional allergens are concerned. Check the food label on your turkey for allergens before you buy any turkey that's labeled organic, free-range, ready-to-eat, or kosher. If you have food allergies or you're cooking for someone with food allergies, you should look for a turkey without added ingredients. Because they cannot include additives, natural turkeys are the safest bet for families with food allergies or for people who are entertaining guests with allergies. Always double-check labels, however. Note that organic, free-range, or hormone-free turkeys are not necessarily "natural" (as defined by the U.S. Department of Agriculture, which regulates the labeling of raw meat products) and may legally contain additives. Although it's less common for these turkeys to contain added ingredients, you'll still need to double-check labels. Dairy allergens, wheat allergens, soy allergens, and corn allergens are the allergens that are most commonly found in commercial turkeys. These are usually in the form of butter, "vegetable protein," or similar additives. To identify turkeys that have these additives, scrutinize the label. Look for additives after the text "Injected with approximately ___% of a solution of ___," which will appear somewhere on the label. For example, one turkey labeled as "fresh" included this on the label: "Contains up to 4% of a solution of water, salt and spices to enhance tenderness and juiciness." It's unclear what exactly the "spices" in that solution might include, although no specific allergens are mentioned. If you can't find ingredients on the labels, look for the phrase "minimally processed." If you find that phrase, the turkey likely was not fundamentally altered from its raw state -- meaning that no ingredients have been added. (That's normally the reason you won't be able to find ingredients on the label.) For utmost peace of mind, though, you might call the customer service number listed on the package to confirm that. Kosher turkeys are popular even among people who don't keep kosher because they've won high-profile taste tests in national magazines and because, unlike natural turkeys, they don't need to be brined (they're presalted). The term "kosher" simply refers to the Rabbinical supervision of the special process under which the birds are raised and slaughtered. Some kosher products do contain common allergens. However, several nationally available brands of whole kosher turkeys, including Empire and Rubashkin's Aaron's, are indeed "minimally processed." If you're not dealing with multiple food allergies, check labels on multiple national brands. While self-basting turkeys do tend to use allergenic additives, they don't all use the same ones. You may find a safe choice. Another option, which may work for small groups or if you want to bring your own turkey to a gathering where you're not sure the food will be safe, is to cook a natural turkey breast or turkey thighs. It's not as festive as a whole roast bird, but it may be a safer option. If you're willing to pay much more, you can order a natural "heritage" turkey online. However, if you do choose this option, you should be prepared to spend upwards of $75 to $100 or more.